If you or someone you love suffers from heartburn, you know that it can be very disruptive to your daily life. Most heartburn sufferers say it stops them from enjoying food. Others say it keeps them from getting a good night’s sleep, it makes it hard to concentrate at work, and it interferes with family activities. Sound familiar? Don’t worry. Heartburn is a pain, but it can be helped. Complete with a catalog of heartburn medicines and a list of reliable Web sites for people with digestive disorders, Heartburn & Reflux For Dummies is your one-stop guide to stopping the hurt, starting to heal, and enjoying food again! Carol Ann Rinzler writes a nutrition column for the New York Daily News and has authored more than 20 books. Ken DeVault, MD, is coauthor of the American College of Gastroenterology's official guideline statements on the diagnosis and treatment of GERD. Part I: Naming Your Pain. Chapter 1: Picturing Heartburn and Reflux. Chapter 2: Tracking Your Digestive Tract. Chapter 3: Cataloging the Symptoms and Hazards of Heartburn, Reflux, and GERD. Chapter 4: Rating Your Reflux Risk. Part II: Eating Your Way to Relief. Chapter 5: Meeting Your Nutrition Needs. Chapter 6: Fine-Tuning Your Diet. Chapter 7: Reviewing Home Remedies, Alternative Approaches, and Herbal Healers. Part III: Treating Your Middle. Chapter 8: Finding the Right Doctor. Chapter 9: Examining Your Esophagus and Testing Your Tummy. Chapter 11: Avoiding Problem Pills. Chapter 12: Exploring Surgical Options. Part IV: Creating a Comfortable Lifestyle. Chapter 13: Building a Better Body. Chapter 14: Healing Heartburn with Healthy Habits. Chapter 15: Stressing Stress Relief. Chapter 16: Fashioning (and Furnishing) a Comfortable Life. Part V: Meeting the Special Cases. Chapter 17: Handling the Heartburn of Pregnancy. Chapter 18: Finding Heartburn in Infants and Children. Chapter 19: Taking Aim at Senior Heartburn. 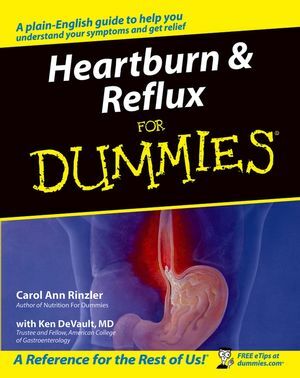 Chapter 20: Ten or So Heartburn and Reflux Myths. Chapter 21: Ten Heartburn Web Sites. Chapter 22: Ten Sometimes Painful, Often Annoying, but Almost Never Fatal Digestive Disorders.